Will The New Day ever break up? WWE Champion Kofi Kingston recently talked with TMZ Sports, addressing the rumors of a potential New Day split. Kofi stated that The New Day isn't a typical faction that splits up eventually, and a break up will never happen. 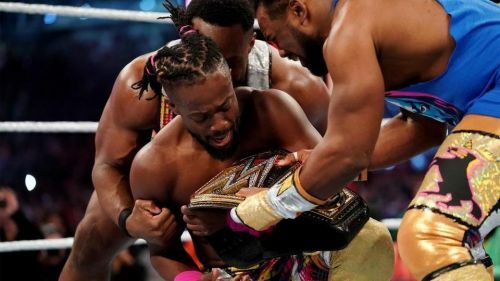 Ever since KofiMania took off earlier this year, the WWE Universe began speculating on whether they would get to see an eventual breakup of The New Day. As WrestleMania drew closer, the general consensus was that Big E and Xavier Woods would possibly betray Kofi Kingston at The Show of Shows, ideally post his win. That didn't happen though, as Kofi Kingston ended up winning the WWE Title and was awarded the old WWE Title by his fellow New Day members. After Kofi's historic win at The Grandest Stage Of Them All, the rumor mill began spinning again, with many speculating on a breakup coming soon. Kofi Kingston has finally put these rumors to rest during his talk with TMZ Sports. The Dreadlocked Dynamo stated that he doesn't understand these rumors one bit, adding that The New Day's philosophy has always been to lift your brother up. Kingston also said that a breakup will never happen and the trio will be together, no matter what. For us to break up, that would be like doing the opposite of New Day and just doing the standard fare. From that aspect alone, it just won’t happen. Everything we do, we do it together. The New Day is all about the group, that’s how it’s going to be. Kofi Kingston is currently on top of the world, as his decade-long struggle in WWE has finally come to a fitting end. As of now, there isn't a challenger set for the newly crowned WWE Champion, but that could possibly change at the upcoming Superstar Shakeup. Would you like to see The New Day break up?